The Conservative Party conference has not had an impact on poll performance. Opinium’s Weekly Conference Tracker shows support for Labour rose by 3 points over the past week, while the Conservatives see no change in their polling figures. However, Theresa May does get a slight boost in approval; her net approval rating marginally increased from -14% last week to -12% this week. 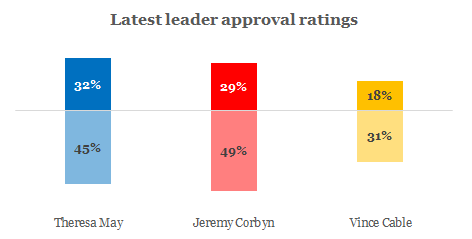 This is the first time since June that Theresa May’s approval ratings are the best of the three main party leaders. And overall, the public think May performed better than Corbyn during the Conference season (25% vs 20%). Boris Johnson as future leader of the Conservative Party? Despite many questions over Theresa May’s position, Boris Johnson does not appear to be the answer.The public think Theresa May is the best person to lead the Conservative Party rather than Boris Johnson (32% vs 17%) and this is even more so the case among Conservative voters (62% think May is compared to 15% thinking Boris is). Johnson’s overtly pro-Brexit stance does, however, win him the support of UKIP voters who back him over May by 57% to 12%. In line with this, over 58% of the public cannot imagine Johnson as Prime Minister (including 55% of Conservative voters), which is similar to the number of people who cannot imagine Corbyn as Prime Minister (57%). Looking at perceptions of character may explain the reason for this. Half of the public (55%) think Boris is vain, which is twice as much as May(23%) or Corbyn (27%). 50% also think he is divisive. Further to this, only 30% think Boris is a decent person, compared to 47% thinking this of May and 39% thinking this of Corbyn.